Hey Creative Scrapbooker Fans- Katelyn Grosart here today! I hope that you’re having a fantastic last few weeks of the summer holidays! 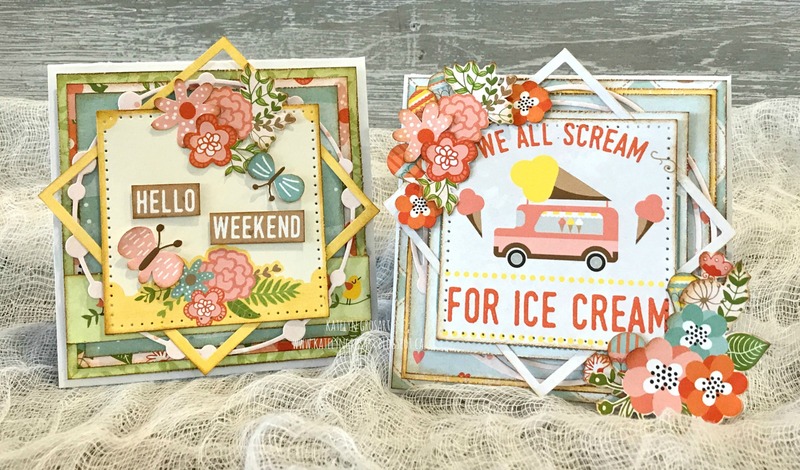 By using the Weekend Adventures Collection from Bo Bunny, some adhesive from Scrapbook Adhesives by 3L, a couple of dies from Elizabeth Craft Designs as well as a few products from Ranger Ink, I was able to create my Hello Weekend & We All Scream For Ice Cream Note Cards. You’ll want to grab your favourite summer beverage as I will show you below how to recreate these note cards in the comfort of your own home. To start, we’ll create the “Hello Weekend” note card. Using Super Stock from Creative Scrapbooker Magazine, cut a piece that measures 4” x 8”. Score the piece of cardstock at 4”. Using the Bear Hug paper by Bo Bunny and the Beaded Circle Frame from Elizabeth Craft Designs, die cut the second beaded circle frame from the bottom right hand corner of the Bear Hug paper. From the same Bear Hug paper by Bo Bunny, cut out the bird border. Cut the bird border down to 3 3/4” long. Distress the edges of the border using an edge distressor. Ink the edges of the border using a blending with foam and Vintage Photo Distress Ink from Ranger Ink. With the Bear Hugs paper by Bo Bunny still out, cut two butterflies out and the flower with cream section out. Using the 2 3/4” Stitched Square die from Elizabeth Craft Designs, die cut the flower with cream section square. You’ll end up with a second 1/8” square. Distress the edges of the flower with cream section. Ink the edges of the butterflies, the flower with cream section and 1/8” square using a blending with foam and Vintage Photo Distress Ink from Ranger Ink. From the Beachy paper by Bo Bunny, cut a piece that measures 3 1/4” x 3 1/4”. Distress the edges of the patterned paper using an edge distressor. Ink the edges of the patterned paper piece using a blending with foam and Vintage Photo Distress Ink from Ranger Ink. From the Blooms paper by Bo Bunny, cut a piece that measures 3 1/2” x 3 1/2”. Distress the edges of the patterned paper using an edge distressor. Ink the edges of the patterned paper piece using a blending with foam and Vintage Photo Distress Ink from Ranger Ink. With the Blooms paper by Bo Bunny still out, fussy cut three flowers out. Ink the edges of the flowers using a blending with foam and Vintage Photo Distress Ink from Ranger Ink. From the Picnic paper by Bo Bunny, cut a piece that measures 3 3/4” x 3 3/4”. Distress the edges of the patterned paper using an edge distressor. Ink the edges of the patterned paper piece using a blending with foam and Vintage Photo Distress Ink from Ranger Ink. From the Good Vibes paper by Bo Bunny, cut the “Hello Weekend” word out. Cut the two words in half and then trim the words down into strips. Distress the edges of the word strips using an edge distressor. Ink the edges of the word strips using a blending with foam and Vintage Photo Distress Ink from Ranger Ink. Adhere the floral paper to the green leaf paper. Adhere the blue wave paper to the floral paper. Adhere the bird border 1/2” from the bottom of the the leafy green paper. Using foam squares, adhere the beaded circle frame to the middle of the blue wave paper. Adhere the 1/8” square frame in a triangle over top of the beaded circle frame. Foam square the flower with cream section square to the middle of the 1/8” square frame.Using thin foam squares, adhere the “Hello Weekend” sentiment to the middle of the cream section on the flower square. Adhere the three flowers to the top of the cream section of the flower square. Using thin foam squares, adhere the two butterflies onto the cream section of the flower square. Foam square the card front to the card base. You’ve now finished your first note card. Now lets create the We All Scream For Ice Cream note card. Using Super Stock Cardstock from Creative Scrapbooker Magazine, cut a piece that measures 4” x 8”. Score the piece of cardstock at 4”. From the Blooms paper by Bo Bunny, fussy cut eight flowers of your choice. Ink the edges of the flowers using a blending with foam and Vintage Photo Distress Ink from Ranger Ink. From the Fly Away paper by Bo Bunny, fussy cut five hot air balloons. Ink the edges of the patterned paper piece using a blending with foam and Vintage Photo Distress Ink from Ranger Ink. With the Fly Away paper by Bo Bunny still out, cut a piece that measures 3 7/8” x 3 7/8”. Distress the edges of the patterned paper piece with an edge distressor. Ink the edges of the patterned paper piece using a blending with foam and Vintage Photo Distress Ink from Ranger Ink. Using the Bear Hug paper by Bo Bunny and the Entwined Circles from Elizabeth Craft Designs, die cut the second entwined circle from the right hand side of the Bear Hug paper. These will be used to embellish the note cards. With the Bear Hugs paper by Bo Bunny still out, cut out the We All Scream for Ice Cream square out and the Good Times square out . Using the 2 3/4” Stitched Square die from Elizabeth Craft Designs, die cut the “Good Times” Square and the We All Scream for Ice Cream, which will leave you with a 1/8” square. Ink the edges of the Good Times Square, the We All Scream for Ice Cream square and 1/8” square using a blending with foam and Vintage Photo Distress Ink from Ranger Ink. From the Stripe paper by Bo Bunny, cut a piece that measures 3 1/2” x 3 1/2”. Distress the edges of the patterned paper piece. Ink the edges of the patterned paper piece using a blending with foam and Vintage Photo Distress Ink from Ranger Ink. We will start building the base of the note card. From the Road Trip paper by Bo Bunny, cut a piece that measures 3 5/8” x 3 5/8”. Distress the edges of the patterned paper piece with an edge distressor. Ink the edges of the patterned paper piece using a blending with foam and Vintage Photo Distress Ink from Ranger Ink. Adhere the heart paper to the yellow house paper. Adhere the yellow house paper to the hot air balloon paper. Adhere the entwined circle to the middle of the heart paper. Using foam squares, adhere the Good Times square to the middle of the entwined circle. Adhere the 1/8” square frame in a triangle over top of the entwined circle. Foam square the We All Scream for Ice Cream square to the middle of the 1/8” square frame. Foam square the three bunch flower in the bottom right hand corner of the cardfront. Adhere two small flowers and two hot air balloons in amongst the three flower bunch. In the top left hand corner, use adhesive and foam squares to adhere the five flowers and three hot air balloons as desired. Foam square the cardfront to the cardbase. You’ve finished your second note card. Have fun creating and making these two note cards at home. I love to fussy cut images and layer a variety of patterned paper to create lots of depth and interest on my note cards. You could even use these card fronts in your scrapbook layouts. Thanks so much for joining me today and I hope that you’re inspired to create these note cards at home!